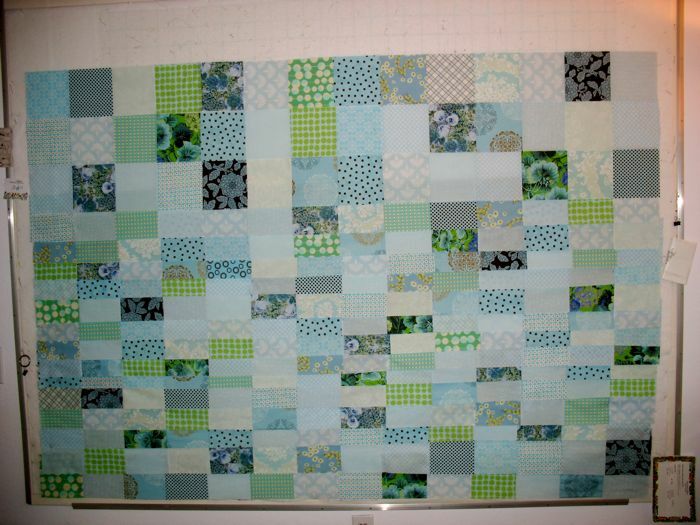 June | 2010 | OccasionalPiece--Quilt! Posted on June 30, 2010 by Elizabeth E.
My son and his wife are having their fourth child this October, and she just announced that it was a girl. 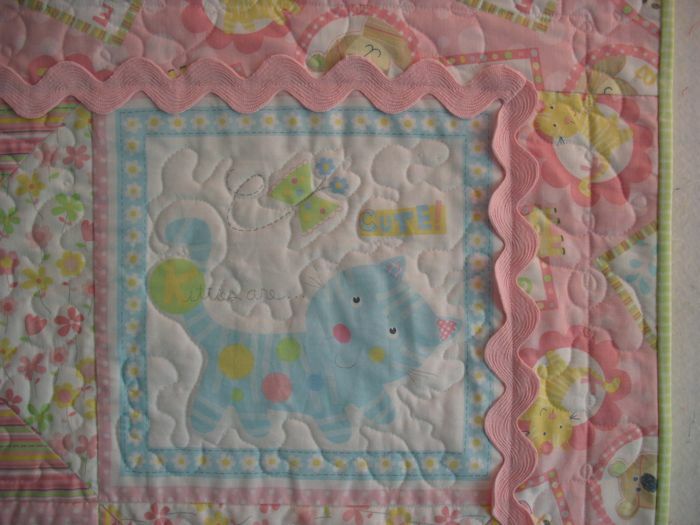 So, I put together this quilt for them, just as I have for all my grandchildren. I liked this one because of the printed panels that show sweet little animals. Awwww. Yep. That’s just how I felt about it. I feel the same way about new babies so it’s a good fit, I think. Here’s a bigger picture of the Sneak Peek detail I showed last week. This is also unique because of the giant rick-rack around the edge of the border. 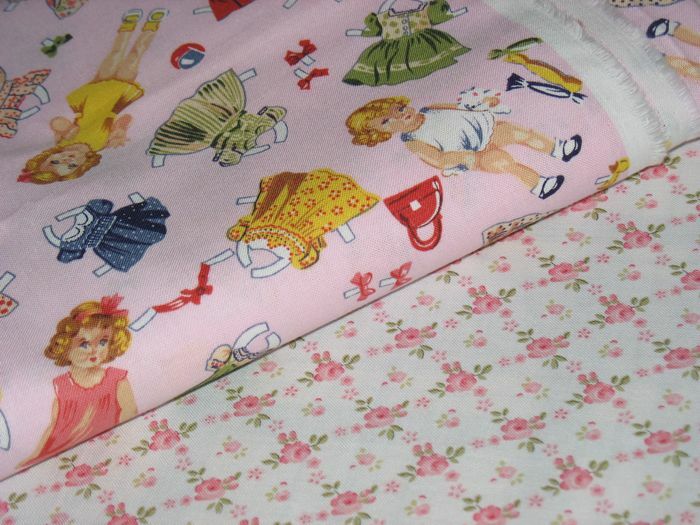 I had originally chosen a cute little print with paper dolls for the backing (see below) but the colors were too strong for this sweet little quilt, so I went with rosebuds instead–a favorite piece of fabric that I’m gladly donating to my newest granddaughter. 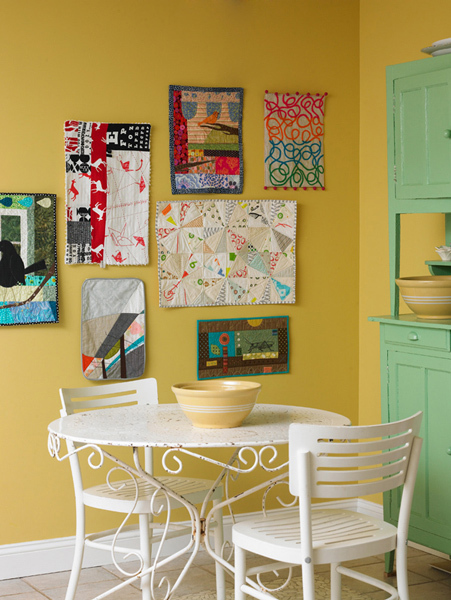 Posted on June 25, 2010 by Elizabeth E.
I love this photo of the wall of mini-quilts from the book just out from Whip-Up, apparently full of great ideas for mini-quilts. I have my own mini-quilt wall, but not all mine are up (add another thing to the list). I pushed them up with thumbtacks in a little unused corner of our hallway cupboards (hence, the crookedness) but I enjoy looking at them as I pass by. The one on the left is from a fractured landscapes class I took from Katie Pasquini Masopust some years ago in Houston, and the one in the center is from a Laura Waskilowski fusing class. 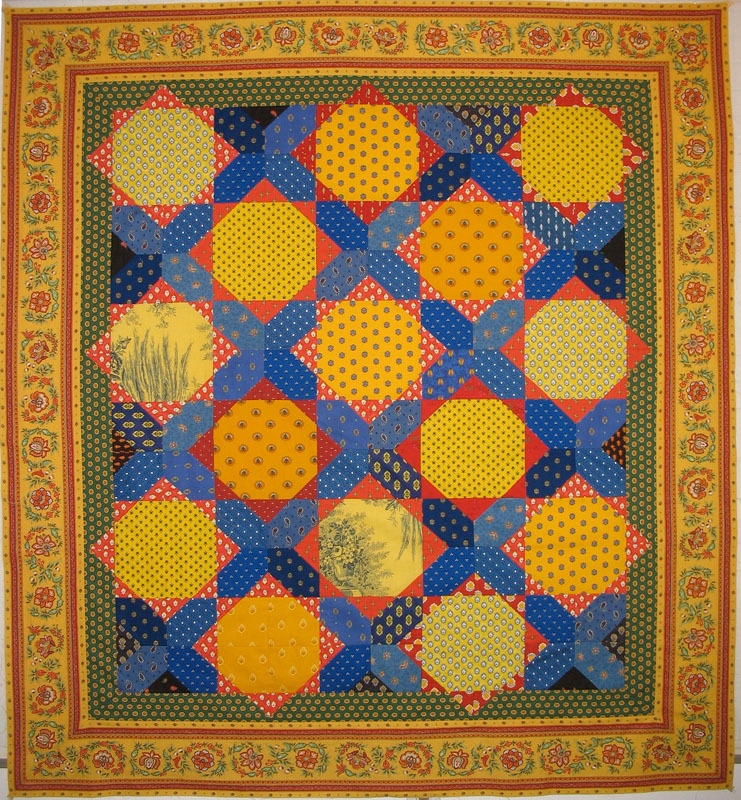 When I used to take classes from the pros I felt the need to make large–BIG–quilts incorporating their techniques. Then at some point I wised up, and made mini-quilts. I learned what they were teaching, and had a “sample” of the technique. I could then decide if I wanted to go on to a bigger quilt, or if the small one was enough. Less fabric to carry to class, and I usually finished the sample that day, instead of adding another UFO to the stack in my sewing closet. Win-win, in my book. 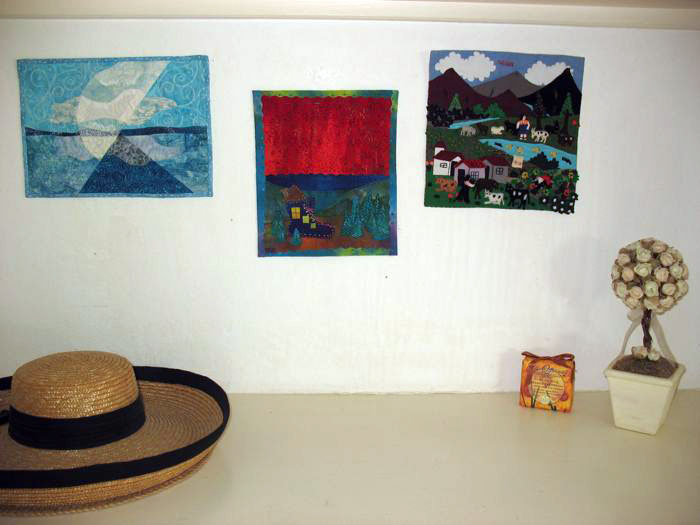 The mini quilt on the right is from Peru and is called an arpillera. We almost bought one in a shop in San Francisco (I had to look through all of them!) but the prices were a bit dear, so my husband found some online for me to choose from and I got it there. And on a somewhat related note. 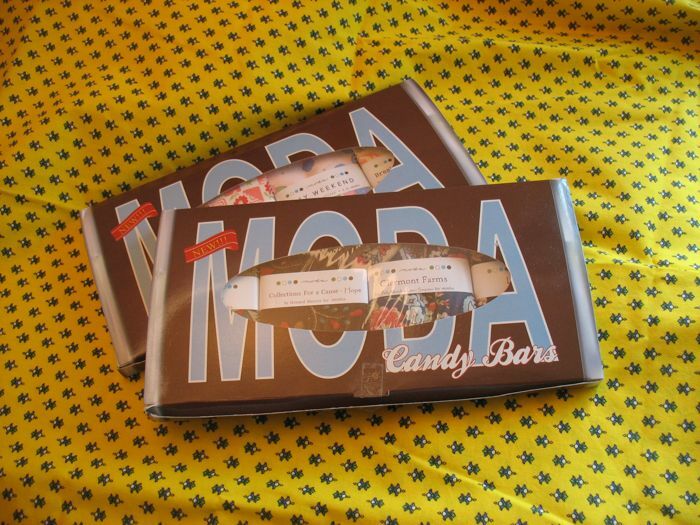 . . Candy Bars! 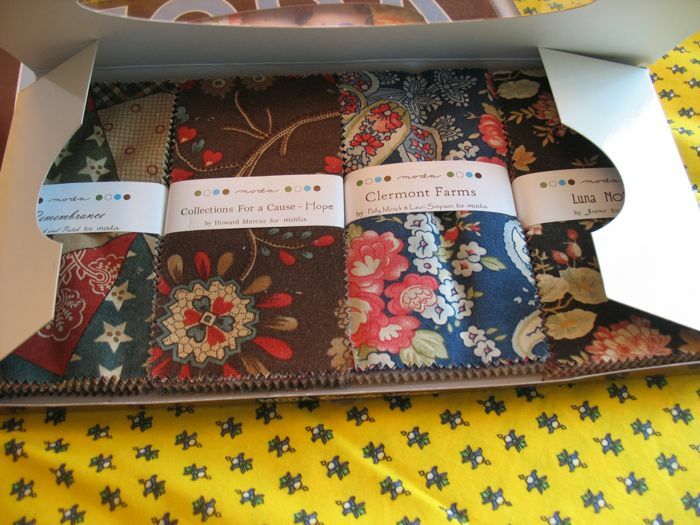 They have a little booklet of ideas in the bottom of the box–I see another possible mini-quilt for my wall. Posted on June 24, 2010 by Elizabeth E.
Here it is, hanging over our stair banister, all complete. Today’s task is to sew the backing (it’s the same fabric as the “fans” just up from the bottom on the very right) and take it over to Cathy, my quilter. 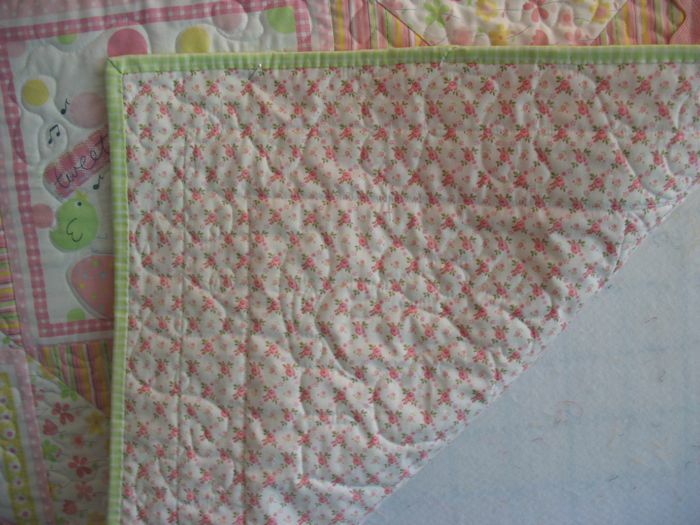 There’s a nice rhythm to piecing a quilt like this: rows and rows and stacks and stacks of squares slide under the presser foot to become a bed covering. I like the complex quilts, like the Christmas Star. I also like more artsy quilts like Provence (Lyon Carolings is the real name), where the play of fabric becomes the focal point. 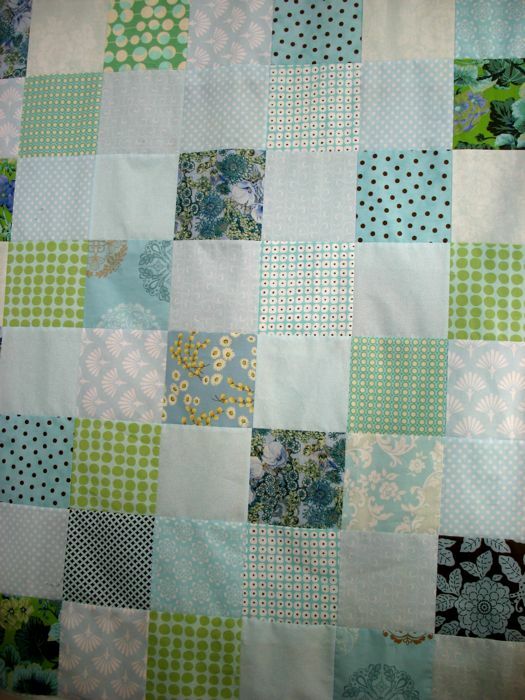 Piecing a one-patch is kind of like vacuuming the house, I think, but certainly in a more enjoyable way. It’s not fancy, nor particularly noticeable, but when the whole house has been vacuumed it gives off a certain pleasure of being clean, ship-shape if you will, or perhaps even just being done for another few days. My life has lots of corners like that. Getting the make-up on when only running a few errands outside the house. Cleaning off the computer desk. Finishing a good book. Writing daily in the journal. It’s the acculumation of patches that makes this quilt, just like it’s the accumulation of tiny tasks that make up a life. None seem particularly noteworthy on their own, but the bits, pieces, squares, and patterns make the whole. Make it complete. 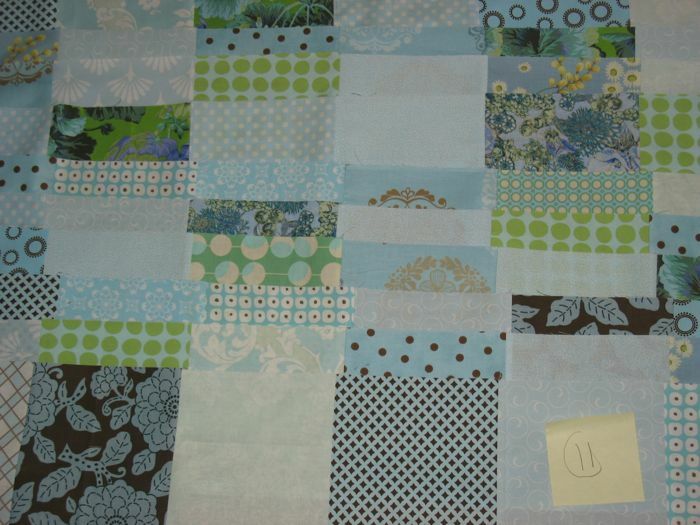 Posted on June 23, 2010 by Elizabeth E.
Trying to keep the random effect in my quilt assembly, I laid out all my blue squares, and just sewed them together in strips of 4 squares or six squares, and laid them out on the floor (below). Then I put them up on the pin wall, but it wouldn’t all fit. So, then I started from the bottom, making sure that the randomness remained, ripping out and moving around and sewing together. For as many squares as there were (12 squares across by 17 squares down) I had minimal ripping out. The bottom rows look like rectangles, but that’s just because I overlapped them in order to keep working–I needed to see all the squares as I worked. Now to sew them all together and get it to the quilters before I go on vacation. 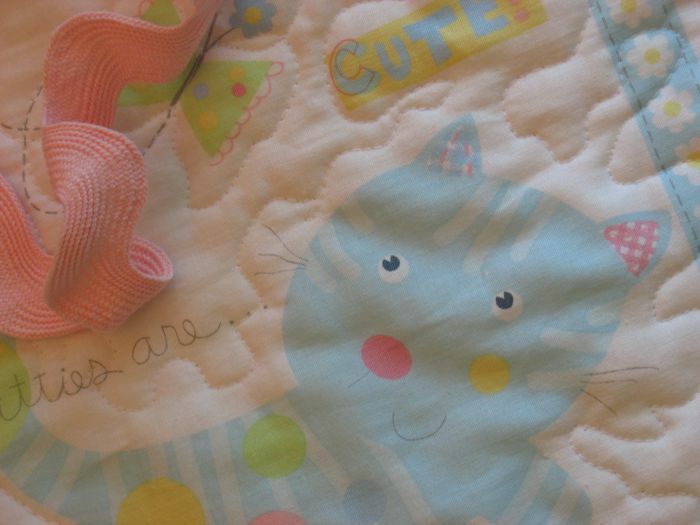 Posted on June 21, 2010 by Elizabeth E.
Working on something very pink, but it hasn’t arrived at its destination yet, so just a sneak peek. The bigger reveal will come in a couple of days. 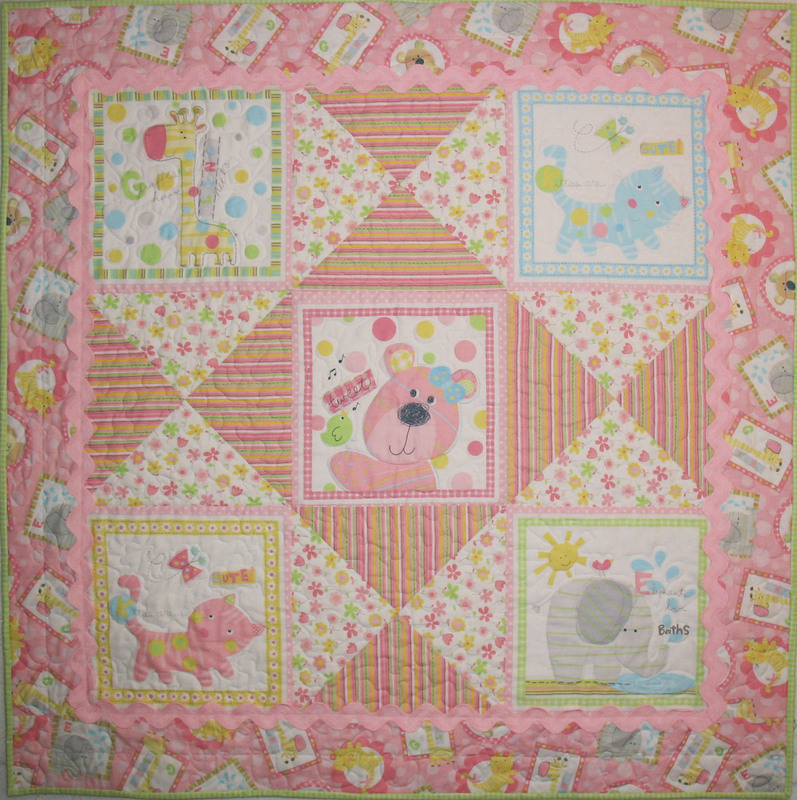 It did keep me busy for the better part of the weekend, and I was thinking happy pink thoughts while I sewed. 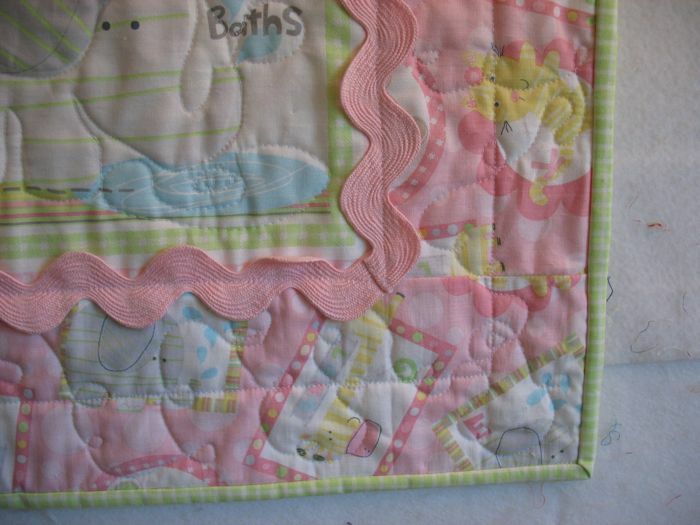 Posted on June 16, 2010 by Elizabeth E.
Here it is in all its unquilted glory. I’m really happy to be at this point. Of course, I can see about five design changes I’d make right now, but I’m not unpicking another seam. It will have to be what it is. I cut the border print slightly away from the red band in order to have a little yellow piece separate and blend with the green initial border. 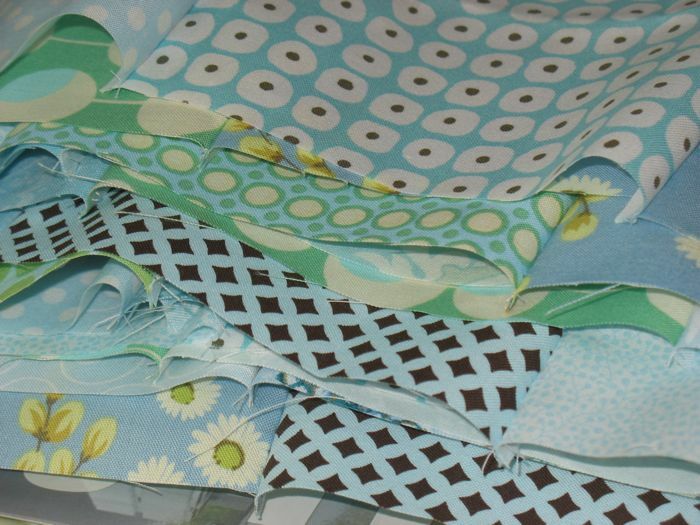 This has gone through so many iterations that I probably have enough for another quilt with Provence fabrics in my bin. That will have to wait. Now on to construct the back–I’m going to try to use some of the leftover border print there. I’ve developed a few tricks for mitering a corner so it turns out half decent, or even better. 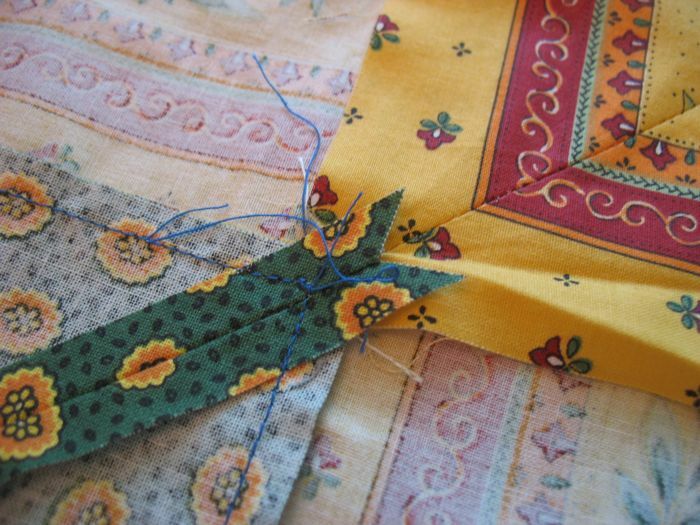 First lay your borders together, folding the quilt corner at a 45-degree angle, folding it out of the way below the borders. 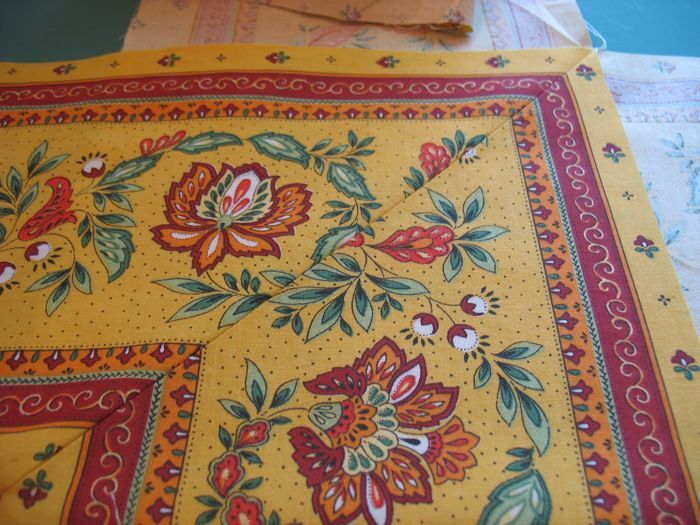 Match up the edges–both the sewn and the cut–very carefully. Put pins if you have to. 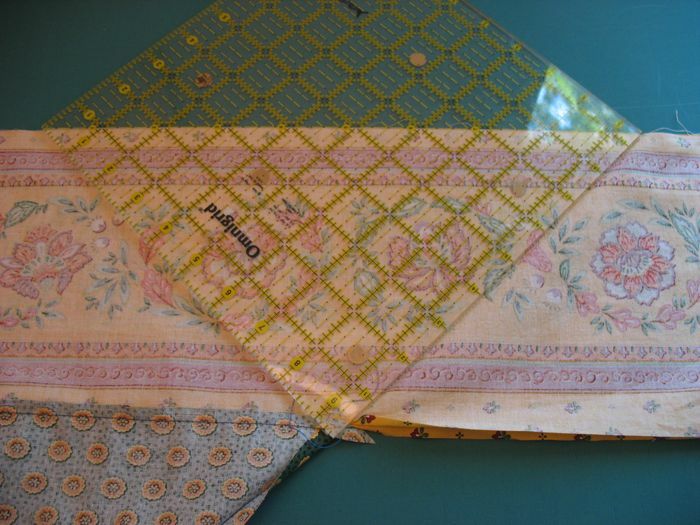 Then using the 45-degree line of your favorite ruler, place that at the upper edge of the border and slide it so that the lower edge is at or just a thread’s width past the folded quilt edge. Draw a line and pin it carefully before moving it at all. DO NOT TRIM at this point. While this really should be the first step, I’ve placed it here because the border miter is already sewn. What I want you to notice is where the blue thread on the green fabric begins and ends: at the seam. 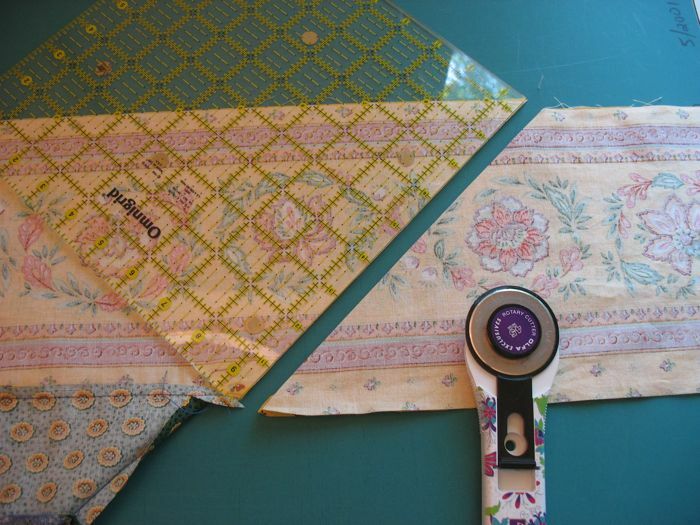 Don’t oversew in this step, or you’ll be picking it out. You don’t need to sew past the seam because the fabric has to have the smallest bit of wiggle room in that area. This is the glory shot: all the lines matched up. A good miter is a thing of beauty forever. A bad miter hangs out in the back of the closet. Line up the quilt and borders as in the first step, replace the ruler so that you allow a 3/8″ seam allowance past the sewing line (I’m cautious here). Slice it off, and try not to have heart failure that you’re cutting the wrong side. If you fold it this way, you won’t (cut it wrongly or have heart failure).